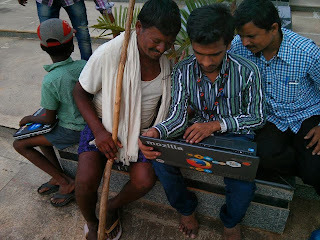 Today I'd like to share about the small Webmaker event hosted by me along with Ajay, Maniraj with a Shepherd and his son in my college who has driven his sheep herd for grazing. Angadi (Sheep Market) is a place where all the shepherds bring their sheep to sell at one place on a particular day and people come to buy sheep for their needs (Especially on festivals like Bakrid). Each village has one day allocated in warangal region and shepherds bring their sheeps to sell accordingly. Many people do not know when Angadi is in a particular village, what is the maximum price one can afford to buy a sheep etc. Many of them gets confused. This is a make made by Shepherd in a Maker Party who want to know people when and where the angadi will be and how much cost one should afford on a particular sheep in Warangal region.